Green. Leprachauns. Shamrocks. Lucky Charms cereal. Rainbows filled with pots of gold. Pinch, pinch!… What is St. Patrick’s day. 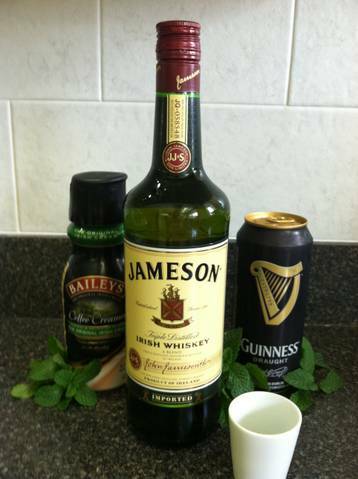 Yes, this is what used to come to mind when I thought of St. Patrick’s day when I was younger. And I still do associate these things with St. Paddy’s day, however, I also like to think of corned beef and cabbage, Shephard’s pie, deliciously smooth stout beer (or any good beer) and Irish Car Bombs. In lieu of this green-filled Irish day, I decided to make Irish Car Bomb cupcakes. I first had gotten the idea to make these a few months ago while I was sitting at the table with my husband trying to think of different cupcakes infused with different beers and liquor. 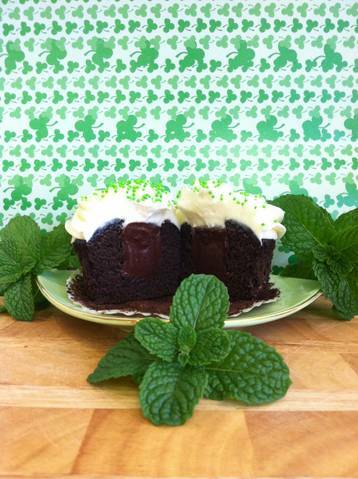 With St. Paddy’s day on the horizon, it just made sense to make an Irish Car Bomb cupcake. So imagine this cupcake in your hand. You bring it to your mouth and take that first bite. First, you get the light, buttery Bailey’s frosting. Then the richness of the ganache and finally, the ever-so-moist chocolate stout cake. A symphony of flavors and textures that work harmoniously together to live “hoppily” ever after. If your’re feelin’ lucky, try out this “Magically Delicious” cupcake recipe. It will knock your green socks off!